Some of the best tips beginners will need to succeed in Oxygen Not Included. 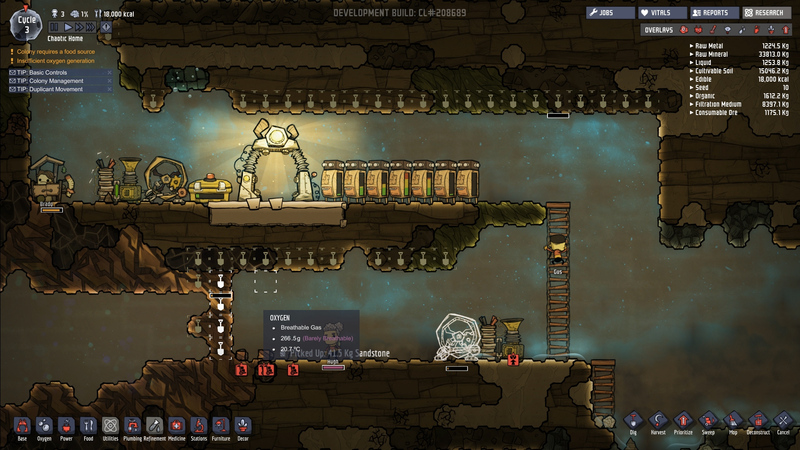 Oxygen Not Included is a game still in its pre-alpha stages which means beginners might have a hard time getting started without the help of a few tips. 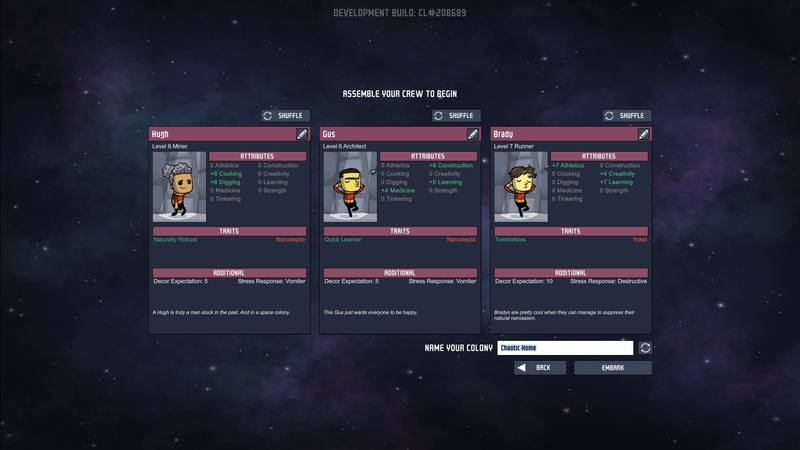 Below you'll find some of the best approaches to settling into your new subterranean colony in Klei Entertainment's upcoming space colonization game, and if you'd like to know more about the pre-alpha, check out our First Look. When assembling your crew, the type of duplicants you select will make all the difference in your progress. Traits that are important for beginners include digging, construction, learning, and athleticism. Lots of points in digging and construction will assist in expanding your colony space, as well as fitting it with amenities. High points in learning will make research and advancing technology much quicker. Great athleticism comes in handy when the crew is manually generating all of the energy to keep everything running smoothly. Aim for duplicants with low decor expectations (0-10 is a good start). Also, make note of their negative traits. If you have someone in the crew who has insatiable hunger or an overactive bladder then plan accordingly. Try being proactive by building an outhouse or a microbe musher as soon as your new colony member arrives. 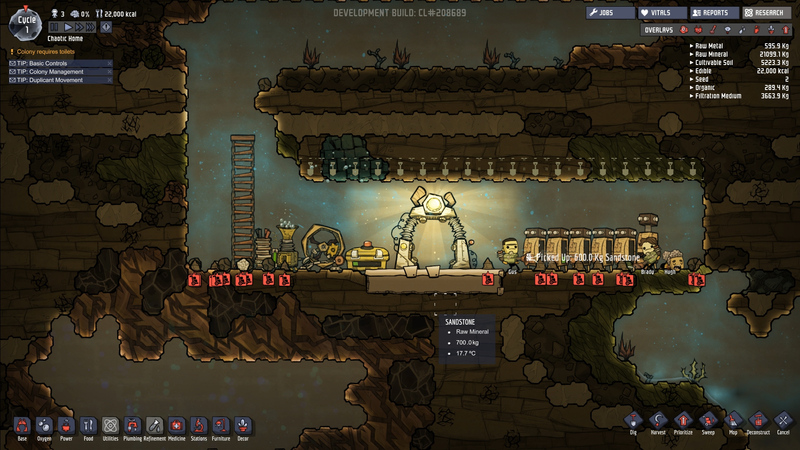 Digging is essential for beginners in Oxygen Not Included because in order to build anything, you’ll need resources. As your colony members dig, the ground will become cluttered with various debris which can affect the air quality. In order to sweep all this stuff away, you’ll have to build storage containers. These can be found under “Base” in the building panel on the right of the screen. A great tip for beginners is to assign one type of resource to each container. This won’t only keep things organized but will prevent contamination since organic material tends to decompose and become toxic over time. As you expand your space colony in Oxygen Not Included, you’ll notice that the quality of the oxygen will become less breathable. It’s important to fix this right away because your inhabitants can die from lack of oxygen. Before you do that, you’ll need to learn how to generate electricity since most appliances in Oxygen Not Included require an energy source. Start by building a manual generator and a tiny battery. These items can be found under “Power”. Connect the two devices with an electrical wire and make this a priority for duplicants with high athleticism since they will excel at supplying the colony with energy. Next, build an algae deoxidizer. This is under the “Oxygen” tab. Attach this to the generator or the battery using an electrical wire. From here on out, whenever a colony member goes for a run, you’ll see the air quality improve. Make sure to add more of these throughout the colony as you expand or you’ll run the risk of having unbreathable air again. Check out our article on how to get more oxygen if you're looking for different ways to achieve this. The outhouse is a necessity since you don’t want your duplicants relieving themselves all over the place. A microbe musher will provide your colony with food, even if it isn’t all that great at first. A research station will give your colony a head start on learning some of the more advanced technology such as farming, advanced plumbing, and much more. The microbe musher and research station will require an energy source so be sure to factor that into the equation when you begin constructing these items. Also note that building should be assigned to individuals with points in construction, and research should be conducted by members with skill points in learning. There you have it! Once you’ve learned these basic concepts and applied them to your new colony, you’ll be off to a great start. 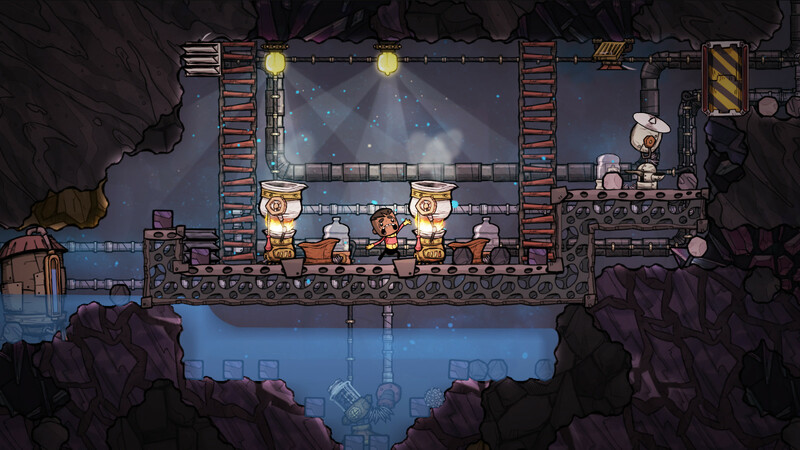 If you enjoyed this guide then you might enjoy our article on how to get rid of chlorine in Oxygen Not Included. If you have any additional tips for beginners that you think we missed, let us know in the comments!